Whoa, what’s that?! No way. That’s a reaction we want from would-be offenders when thinking about initiating a crime attempt on our property. We’re often told to adjust, adapt, and overcome as we grow up. Life comes at us fast and from a lot of angles. So part of our hardwiring is adaptation. And humans aren’t alone in this ability. Bacteria, tumors, and viruses all rapidly acclimate to changing environments and threats. Some criminal offenders, of course, do the same. In this column, I frequently stress how asset protection strategies and their components should be tightly focused on the dynamics of the problem. A crime or loss problem should be well defined: who, what, when, where, why, and how specific theft, fraud, or violence crimes are being conducted is critical information. The steps most criminals must take to accomplish their offenses are our aiming points. Our countermeasures should be designed to deter, disrupt, or lead to detention at each step: during the ideation, initiation, and progression of a crime. And a good diagnosis helps us generate better outcomes by shaping precise countermeasures this way. We make their contemplated offense appear to be too difficult, too risky, or not worth it. And the earlier we can deter or disrupt them the better. But unfortunately, this focused process is not a one-time, fire-and-forget exercise. Offenders adapt, and so should our precision LP/AP efforts. Asset protection is both a process and (hopefully) a result. And since offenders adjust, so should our focused treatments. We know from extensive research that criminals quickly or over time assess your intent and capability to defend your people or places and respond accordingly. They may not get it right, sometimes not even close, but what they (not we) perceive is what they act on. So we need to keep this in mind-we must aim ahead of the target, so to speak. Consider how a given solution or solution set might make breach burglary (for example) harder, riskier, or less rewarding for an offender-at each offending step. Also consider how we will help them notice, recognize, and respect these treatments in the five zones of influence and, finally, how we will change these tactics up as their effectiveness inevitably decreases. Offenders adapt mostly because of what they’ve heard, like “nobody watches the cameras there” or “they don’t ever stop anybody.” But they also evolve these adaptive resistance mechanisms or perceptions on their own, during their own adventures. Remember that our human brains are wired to constantly try to predict what ifs, and our job is to help bad actors make better choices. So by slightly altering signage, positioning, and visual and aural cues, for example, we can keep most offenders a little off-balance and reduce crime attempts. Employee theft is a major problem for many employers in the United States, accounting for the two highest percentages of retail shrinkage according to the 2016 National Retail Security Survey. To mitigate this problem, many retailers in the US deploy bag search policies at their facilities to deter employee theft and to catch perpetrators engaged in theft from the company. While some organizations maintain bag search policies, others conduct bag searches on an as-needed basis. This report explores the proportion of retailers who conduct bag searches, facilities where the search is conducted, the main drive behind a search, and the items that are being searched. 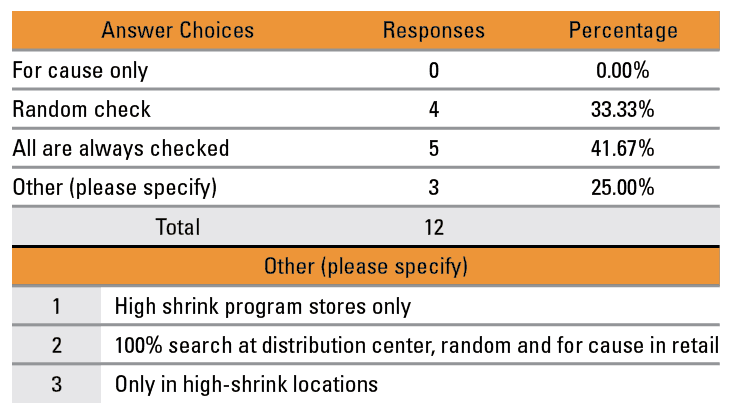 Twenty-one leading US retailers participated in this study, although three survey responses were withdrawn due to incomplete answers. 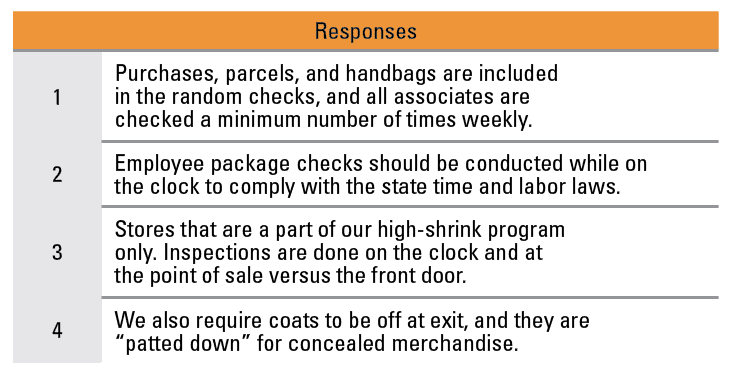 Of the twelve participating retailers with an employee package check policy, two of them have the policy in all facilities, five of them have the policy in stores and distribution centers, four of them have the policy in stores only, and only one of them has the policy in distribution centers only. None of the participating retailers have the policy in their offices. Crime and Everyday Life (fifth edition) by criminologists Marcus Felson and Mary Eckert is published by Sage Publications. This iconic book uses very practical examples to explain the dynamics of crime, along with common sense anti-crime suggestions.